There are 2432 posts in this topic. You are on page 38 of 49. The left orbit diverted to the right flipper is genius. I prefer the play of the premium. I’m a sucker for drops too. Doesn’t that hinder the ability to collect bonus multipliers if there is no gate to keep ball up top? Just asking as I have not played premium. Not sure when it doesn’t loop all the way around, but you’d just have to concentrate on going up there when you know it will feed the pops. Does the right orbit ever stop in the lanes? I believe in the pro, sabertooth does not loop around from the right orbit. Same on Prem/LE. Sabretooth stops in pops, period. Since bonus is worthwhile now, I generally shortplunge into pops on my Prem and LE both at start of ball and on any intraball plunge. Because yes otherwise the L and R orbit will go past the pops. Scored for $2 at the bar's vhs night! I did yesterday and there is a thread for them. Having weird intermittent issues with my right flipper. Sometimes it gets stuck in the raised position after releasing the button, and sometimes it will fail to flip when pushing the button. Checked the switches and everything looks good. Anyone else having similar issues? New spring to pull flipper back and adjust flipper leaf switch. 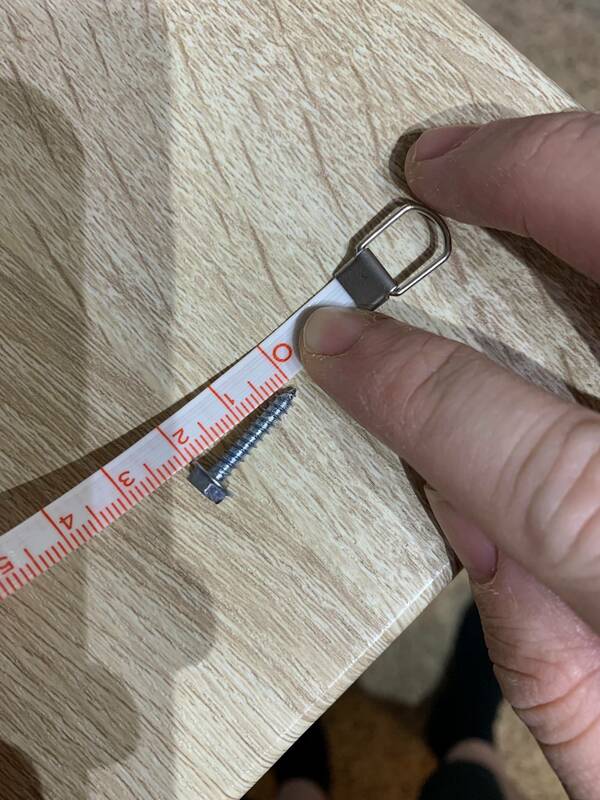 seen quite a few headless lil'DP's have stern addressed it? The head is still on my LDP, but im concerned it may only be a matter of time. I just used gorilla glue gel, LDP seems to be solid now and no mess. Mine didn't lose his head, but the spring was loose on the neck and kept turning the entire head to the right over time. I used gorilla glue and it hasn't moved since. 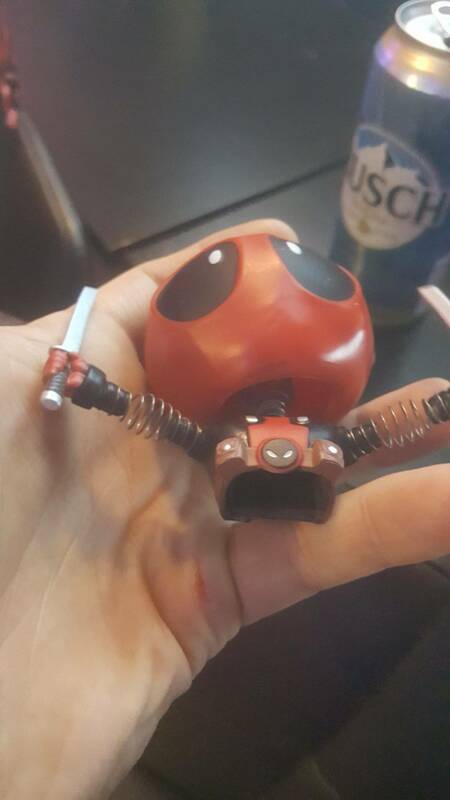 This happened to my Lil Deadpool. Messaged Stern. They asked for pictures. Waiting to hear back. I installed the side armor today. To be honest I was expecting a bit more than a powder coated metal frame and a cardboard sword for $250. I'm not going to return them, but I probably won't be getting the topper based on this experience. I still LOVE the game, I'm just disappointed with the quality of the side armor. If it I'd spent $80 or $100 I'd be happy, but this is not worth $250 IMO. 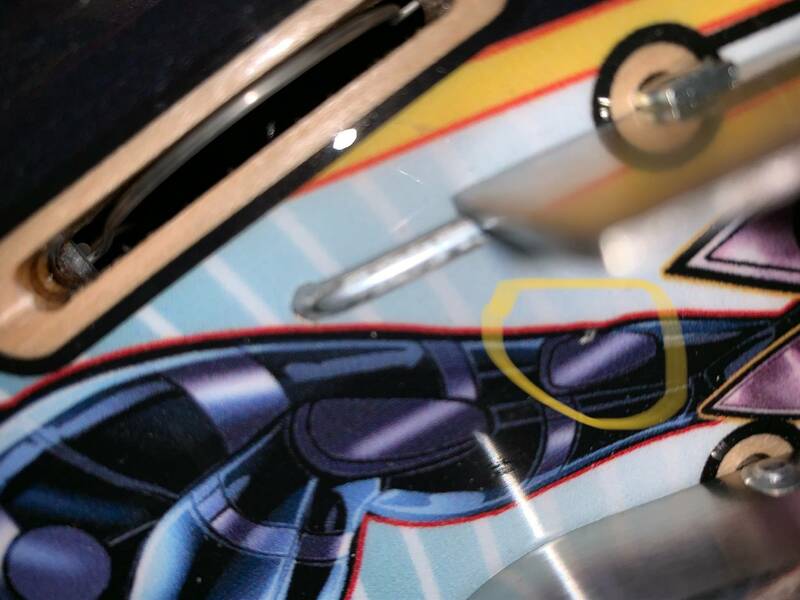 Edit: I'm not sure how I overlooked this, but the armor frame is plastic, not metal. So we have plastic frames with some cardboard. 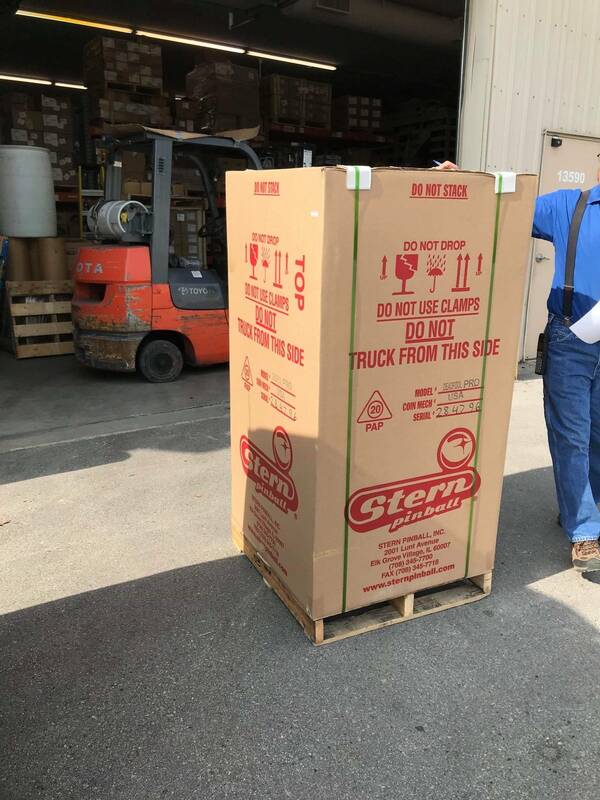 For $250. I don't feel this is worth anywhere even approaching $250.00. StoneyFL last edited this post 49 days ago. 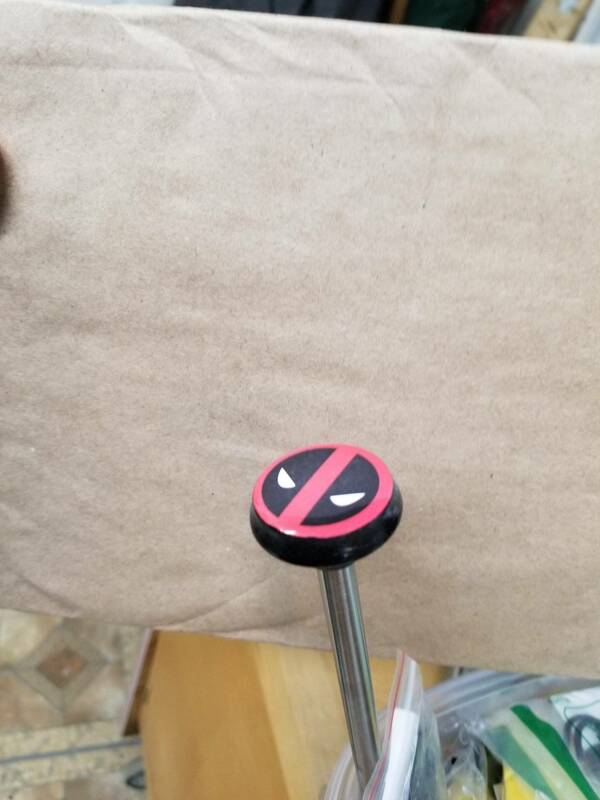 I was playing in the garage and whipped up a Deadpool shooter rod. I was wondering if anyone would be interested in one? they would cost 50 shipped . here's a pic of the prototype the rest will probably look a little better. 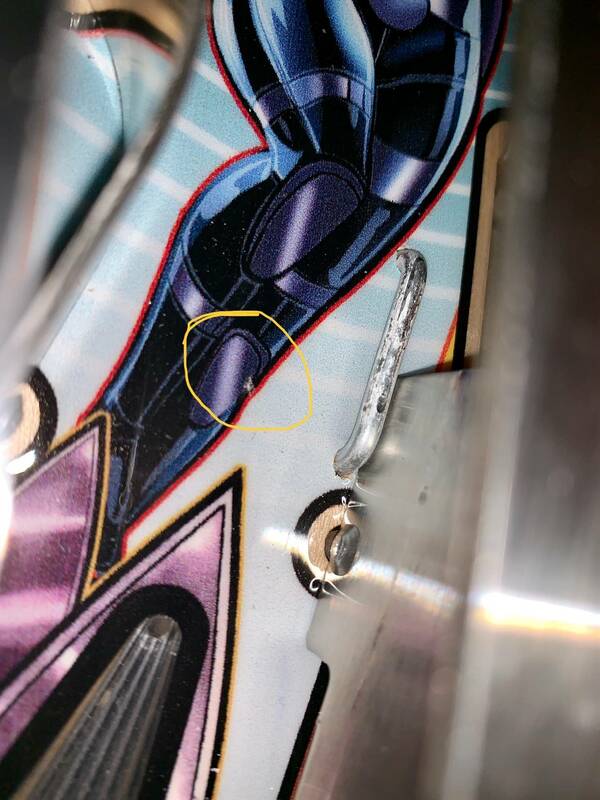 Sadly, I found that there is a screw that went through the playfield right by Domino’s legs. 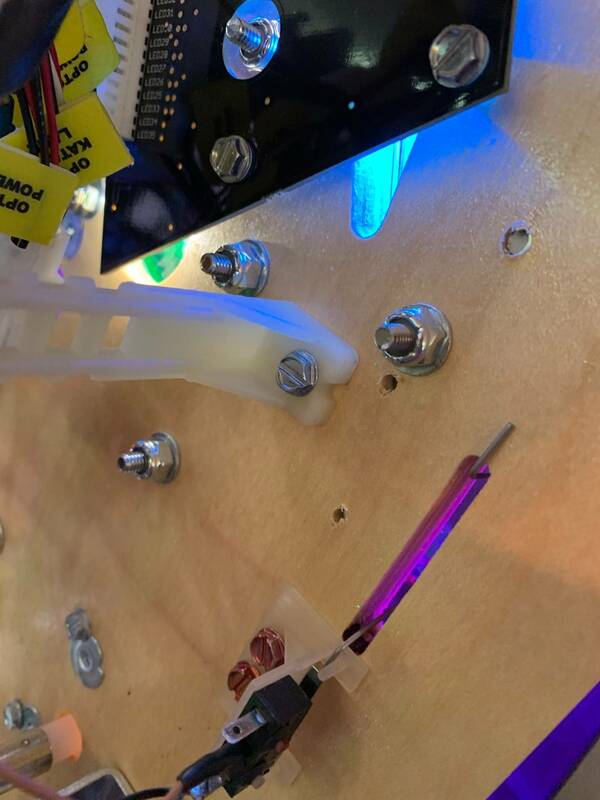 It ended up being the screw used to hold the wireframe. 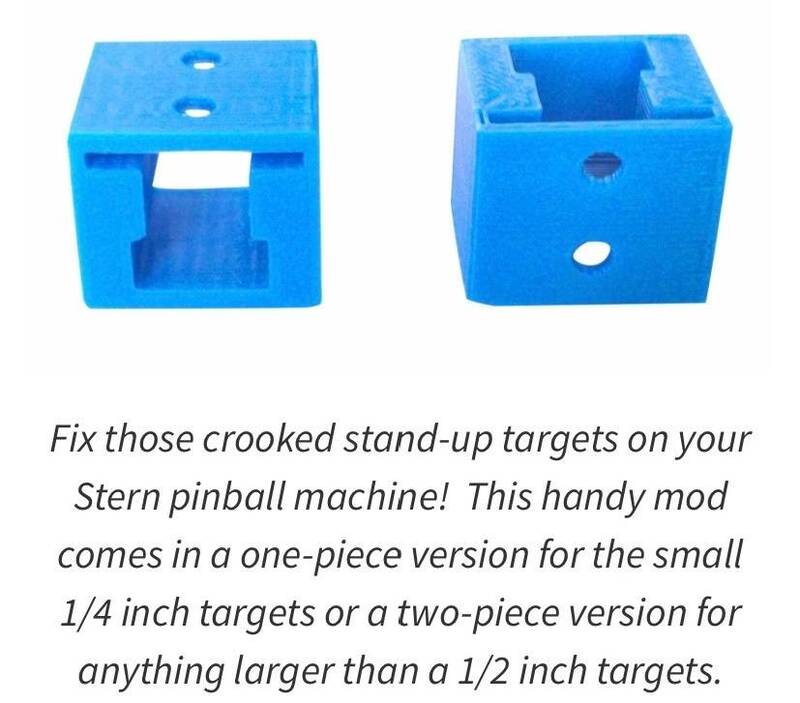 Contacted Stern to see they have any suggestion on how to clean up the hole in the playfield. Ouch... did you also check the other holders? Code 0.99.0 is out! Changes to mode stacking! Complete D-E-A-D targets to light "BATTLE". - EASY: "BATTLE" lit at ball start. - MEDIUM: "BATTLE" lit at game start. - HARD: "BATTLE" not lit at game start. Complete P-O-O-L targets to light "LOCK". - EASY: 3 locks lit at game start. - MEDIUM: 2 locks lit at game start. - HARD: 1 lock lit at game start. - EXTRA HARD: 0 locks lit at game start. will pulse slowly when a Quest can be continued. 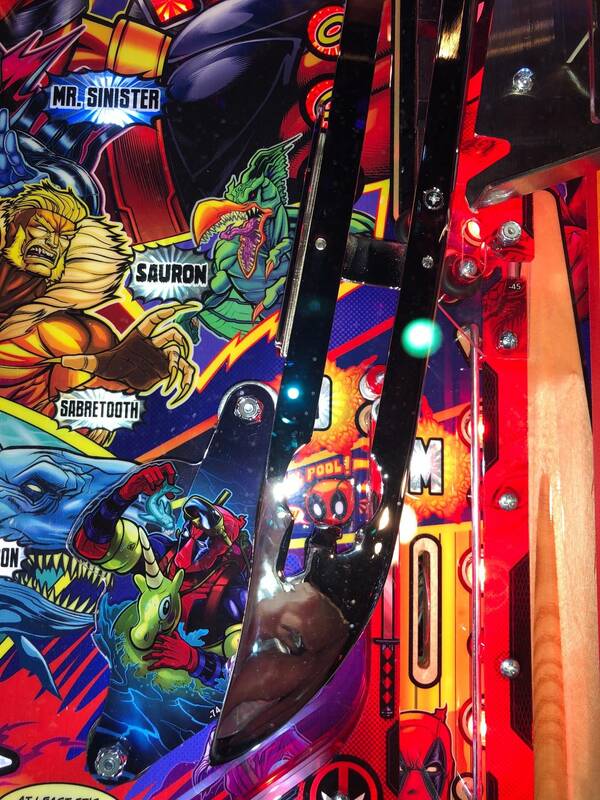 - Complete T-Rex, Megalodon, and Sauron Multiball to light Mr. Sinister Battle. 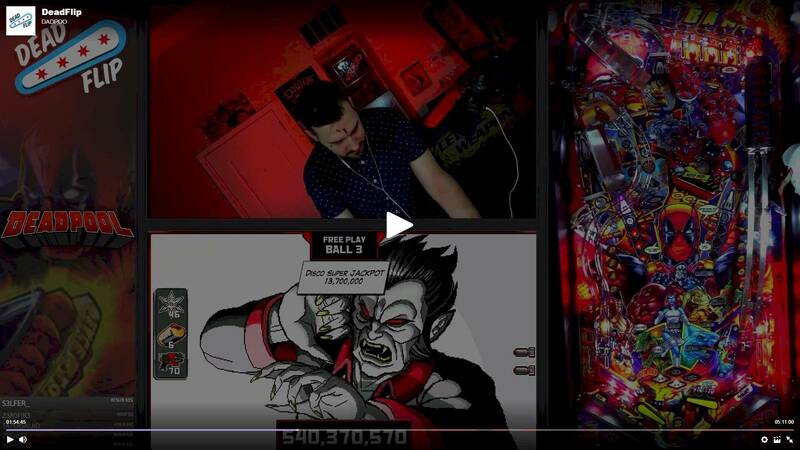 Mr. Sinister Battle to light Mr. Sinister Clone Multiball. 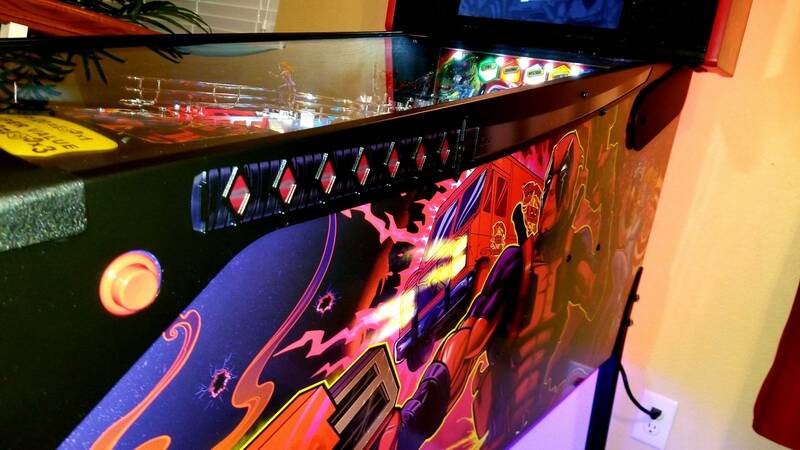 - Completing Mr. Sinister Clone Multiball restarts the mode progression. 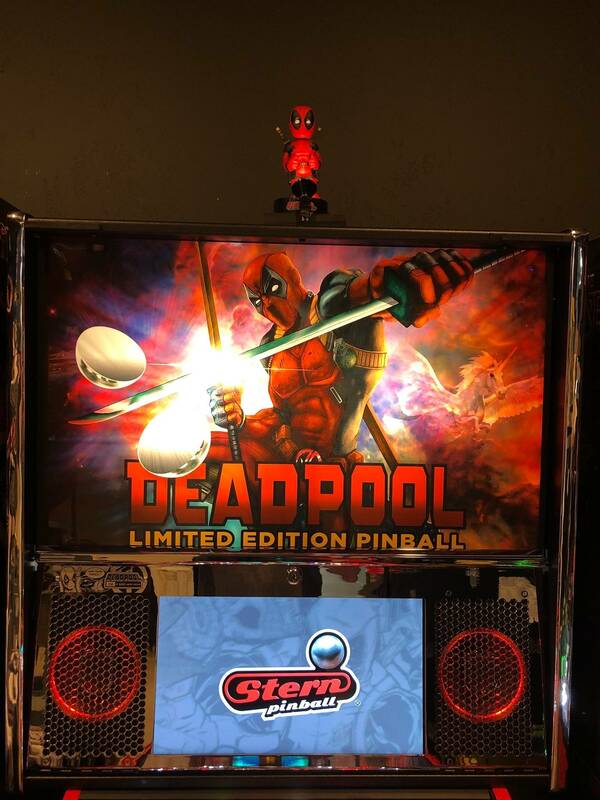 or Lil' Deadpool single ball modes are running. - Quests can start when Katanarama Time or Berserker Rage are running. 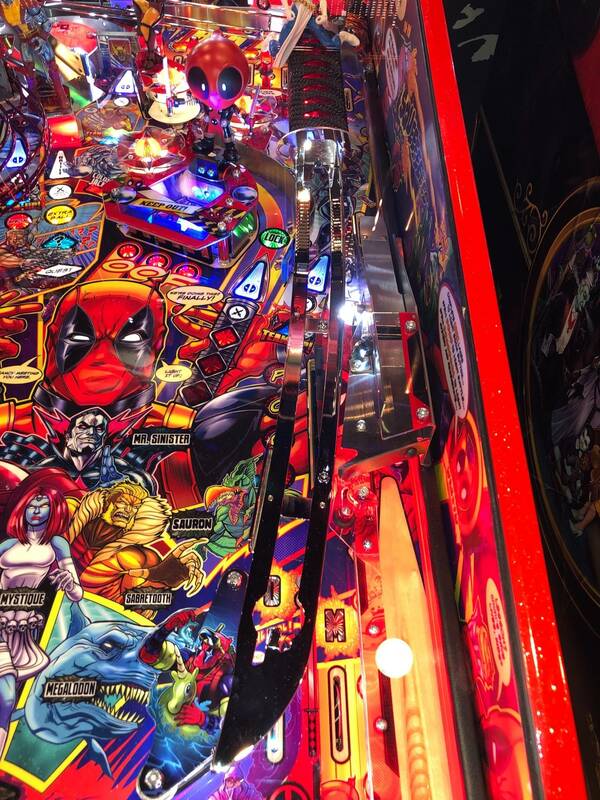 or Ninja Multiball are running. 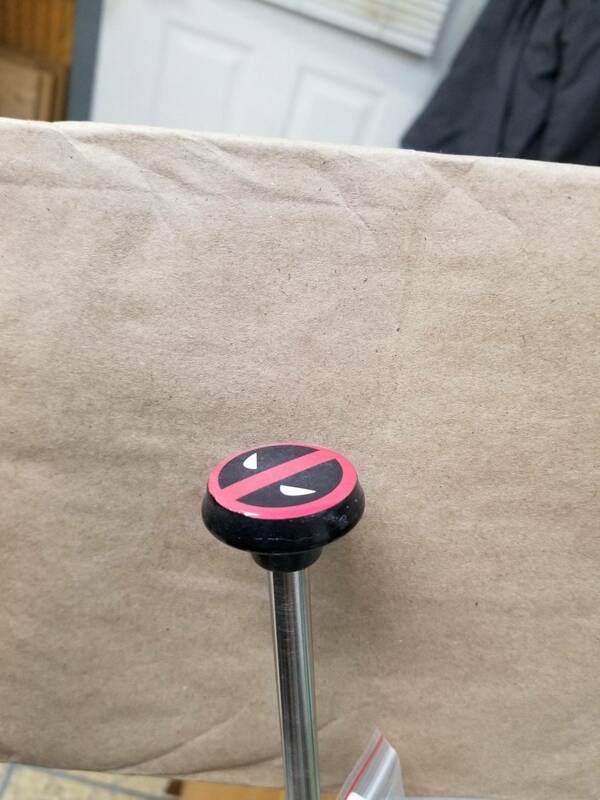 - Fixed: Katana Lock intermittently released too many balls. - Fixed: Mystery was not awarding Extra Balls. - Fixed: Megalodon Quest - Super Bomb unlit all shots but did not end mode. - BOOM awards shark (red) shot. - SUPER BOOM awards all lit ocean (blue) shots and shark (red) shot. - Award light shows tweaked. 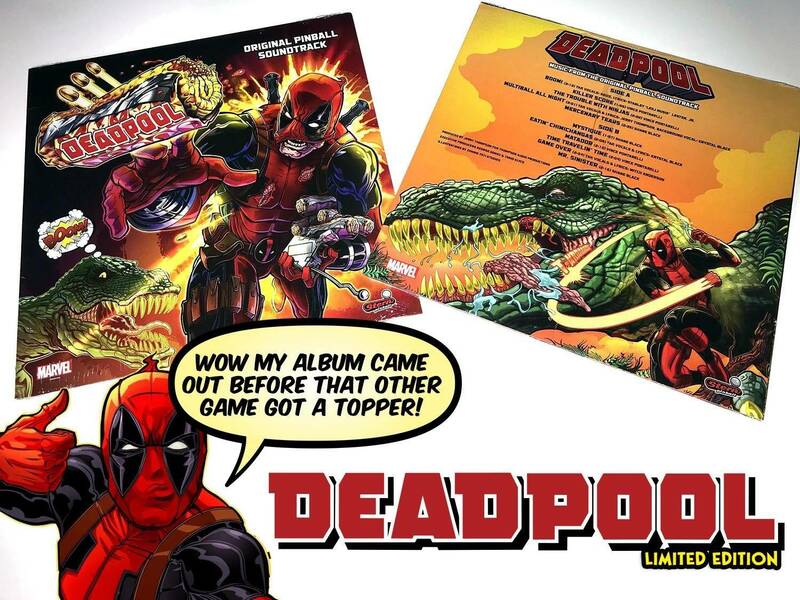 - Lil' Deadpool speech added for "not ready" state. 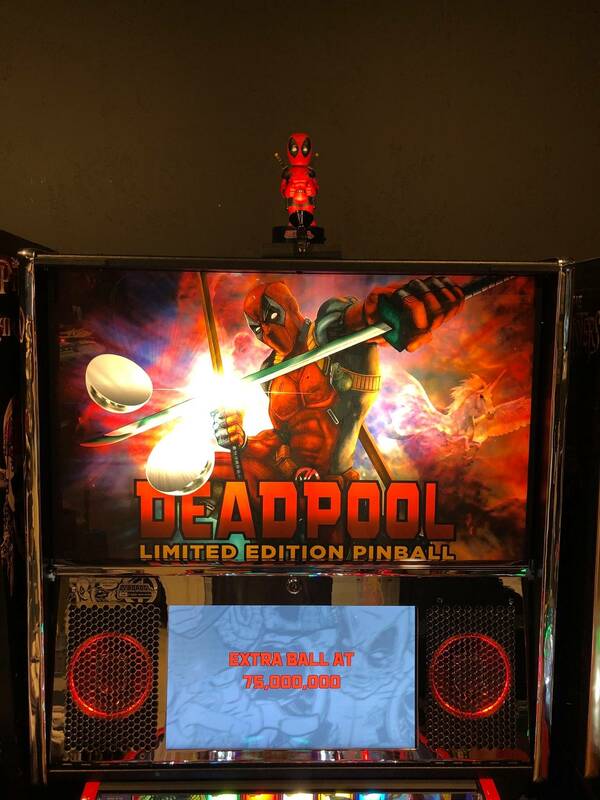 - Lil' Deadpool Multiball - Phase 3 light show improved. - Lil' Deadpool Frenzy - light show improved. 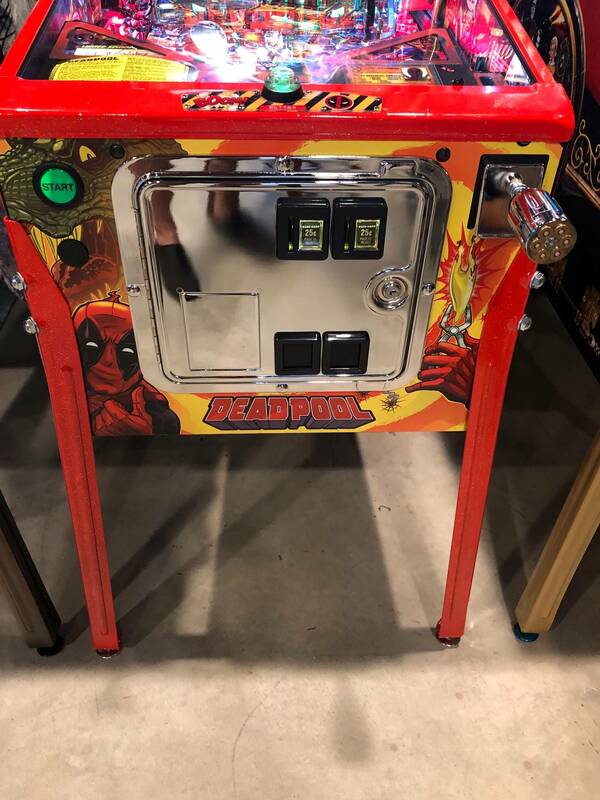 - Hitting 3 moving targets lights the Lil' Deadpool Bounce Jackpot. 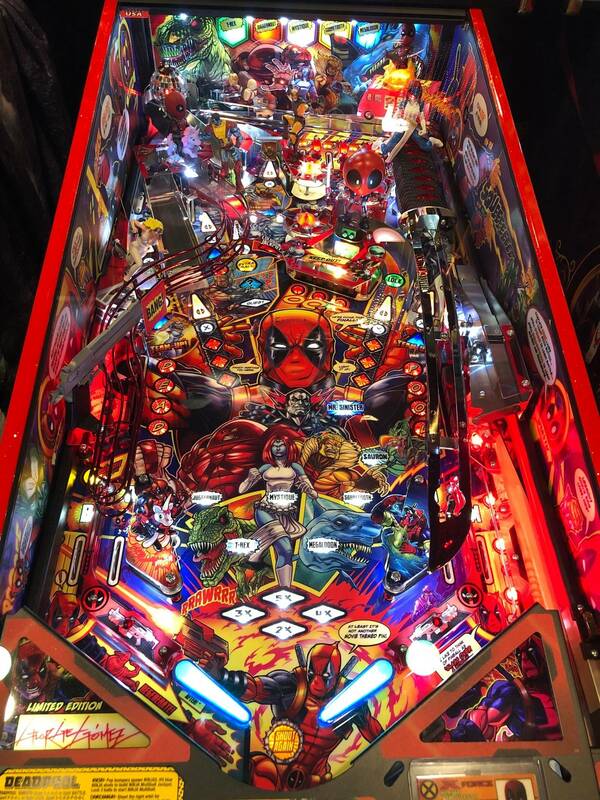 and boosts playfield multiplier for rest of ball. - Improved display, light, and sound effects. 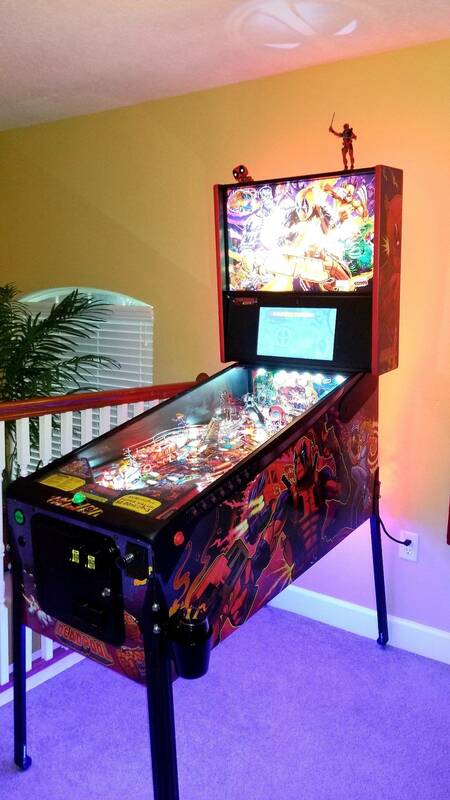 - Mechsuit Multiball - added Super Jackpot animation. 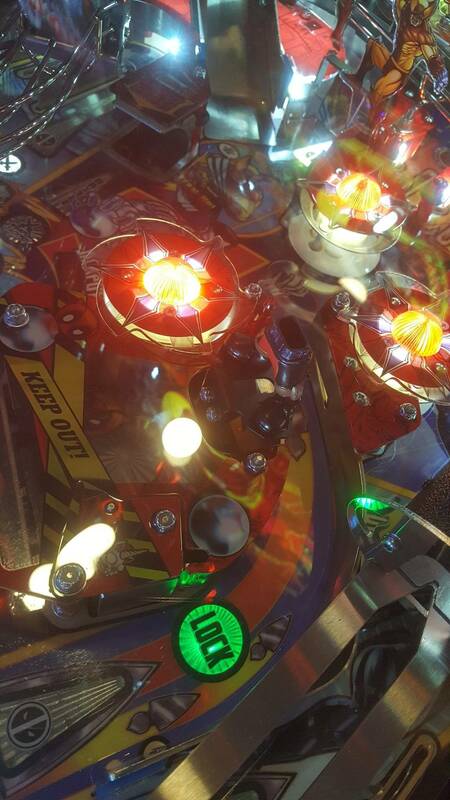 balls are fed into the pop bumpers and do not interfere with the left orbit shot. 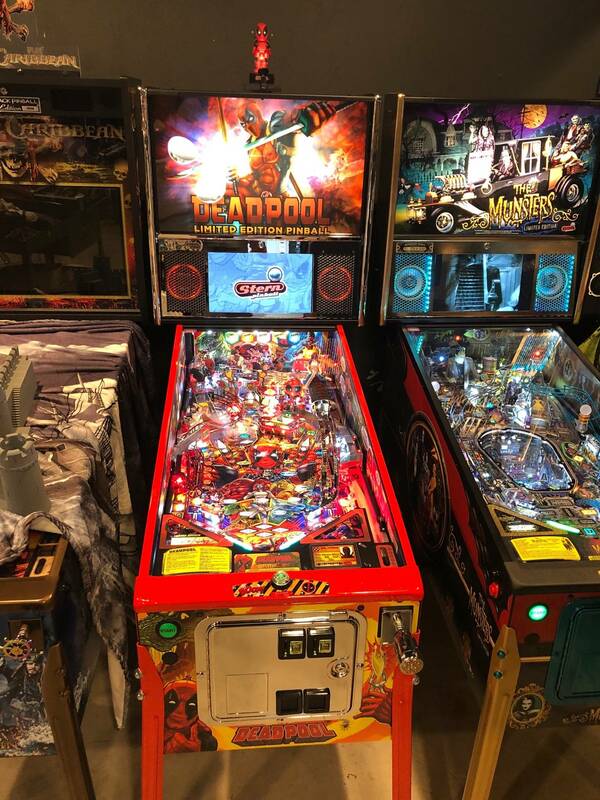 - Disco Multiball - GI no longer turns off during multiball. - Center eject - increased switch debounce time to reduce early courtesy kicks. - Tuned frequency of speech during Battles. - High Score To Date song added ("BOOM"). - Topper light shows added. - Added Custom Coin Door Editor. and the center slot generates 4 PULSES for a dollar bill being four quarters. be reset to the factory default for that Game Pricing selection. knocker is also enabled, it will be syncronized with the Q24 knocker. I LOVE the look when the GI goes off and disco ball lights up. Hopefully this can be made to toggle on or off in 1.0. I'm excited that the first Sinister Battle is easier to start - we haven't been able to get to it on our machine because the Sauron-enhanced modes are tough. This is a cool compromise. Agreed. I really liked the light show during Disco Multiball and the challenge of watching the balls without the GI. Something tells me they probably didn't want to do this but overwhelming complaints/comments turned the tide? I love when everything goes dark on this machine, don't have premium so don't experience disco, but when you hit a shot during megaladon and go goes out, its like you got dunked under water for a second and then everything comes back up. Default it to GI ON and provide an option for the owner to turn it OFF, like they did with the intense flashers in GOT... problem solved BOOM! I don't have a disco ball since I only have the Pro, but I loved the GI turned off because it still looked like a disco light show going off. 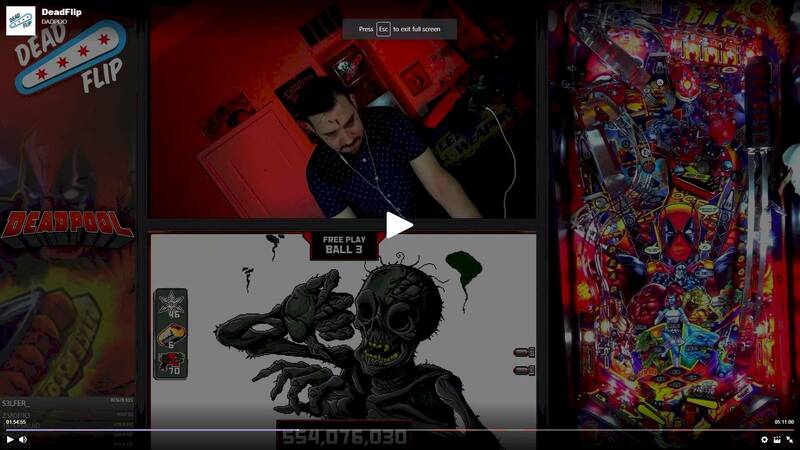 I agree, there seems to be this movement recently that the playfield always needs to be brightly lit or else the game isn't playable. I agree that we should have the option of having the GI off during disco MB. 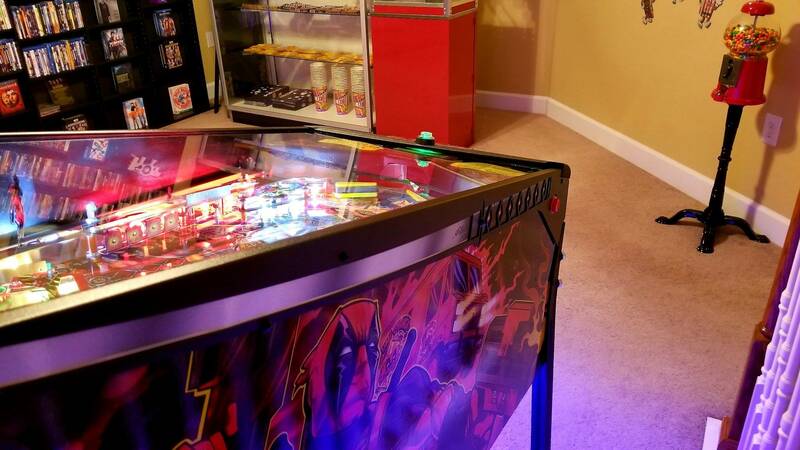 It really is a cool effect with the spots of light not only dancing around the playfield but the entire room. I know some people have complained they can't see the ball when the GI goes off, but I never had a problem and like others have said love the effect. Agreed there should be an option so everyone is happy. 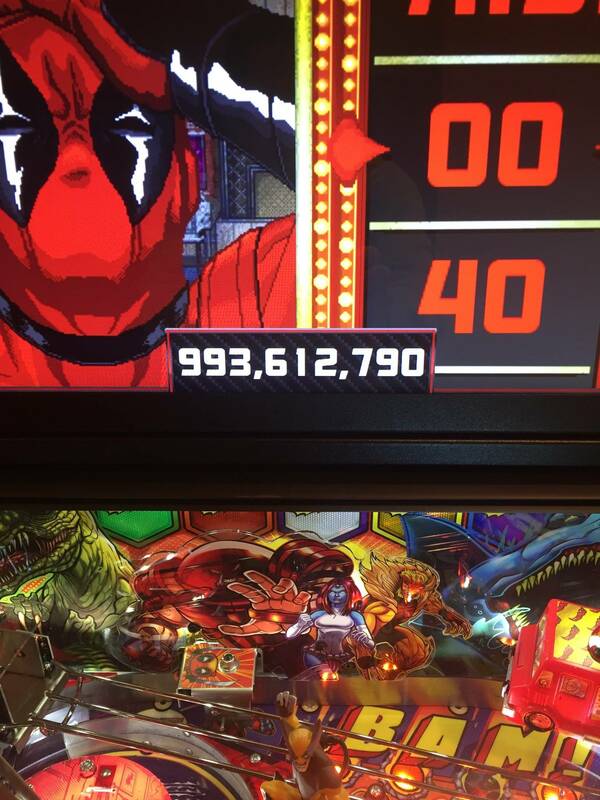 Newb owner, didn't realize high scores got reset with a firmware update. Oh well, at least I got a picture. I’m here to complain about the removal of the GI turnoff code change for disco multiball...seems like several beat me to it! Nice update. The stacking is awesome and doesn't seem to get messy. Glad Mr S is a bit easier to get to now. I feel like I was never close before, whereas I just had a good game and just had to finish T-Rex to get to him. Adding a second phase (Clone) for finishing the second battles is great. Feels like a nice balance for all skill levels now, with Clone being really hard, but seemingly not impossible for a decent player. Really liking how this game is shaping up! I will also echo that I'd like to see an adjustment for the GI in Disco. At the very least they could leave it on but dim it down to 25% or something. But a setting would be the best solution (maybe let us pick on/off/dim). I like the new 0.99 changes, but I'm in total agreement with those who don't care for the Disco mode GI change. I just hit that, and it the awesome disco mood is gone. Something about the lights going out when the cheesy (but awesome) disco mode starts just felt cool. Stern, please give us the option to keep Disco as it was! I'm on the fence between this and BM66. Was leaning to DP, and this really ups the ante. I like that they put this at .99. Makes me think that there's still more to come, and it will get even better. BM66 might have a current code edge, but it’s SUPER clunky. Played it a bit this summer and thought the layout is pretty awful. Sold my Batman to get DP. Great game, but just couldn’t hang with the tight orbit shots and not a fan of the crane. Code was insanely deep though. 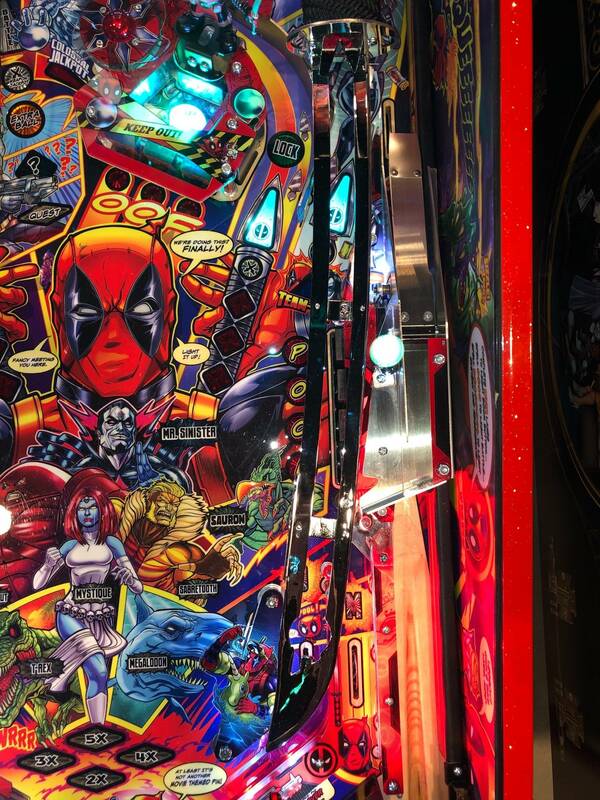 DP shoots a million times better, and while not the deepest game, it has a superb variety of random modes that flow into each other... music, sounds and light show are also top notch. DP feels basically done to me and I’d be fine with the content in place now. I’m not a fan of theme at all, but the design team did a great job with their interpretation of it. How do we give this guy 10,000 up votes. Now we need a bunch more people to send email so we get in 1.0 code. I sent a nice email as well. I put in serious time on both last weekend. BM66 was tough shooting, but I could find most of the shots. It was easy to lose them again!! I did think that DP shot well, even the Katana ramp. The Snikt shot is so damn hard, that when you hit it, it is one of the most satisfying shots in any game. I’m not a fan of theme at all, but the design team did a great job with their interpretation of it. I like both themes, but the DP layout is better and that's what's pushing me in this direction. 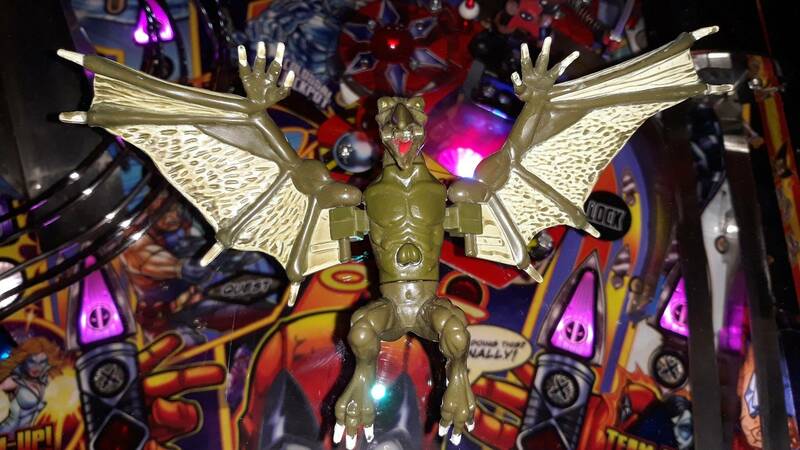 While both are basic fans, DP has some really interesting playfield differences. I sent an email also. I actually don’t like the new light show during certain modes even outside of disco mode. It’s actually too bright now. I think they had a good mix with .98 on the light show.